Blister-Free Socks are a double-layered sock that rubs against itself so that your feet do not rub against your footwear, reducing soreness and blisters. 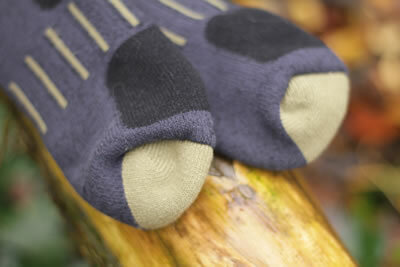 The soft yarn of the Blister-Free Socks is made using 62% cotton, 29% nylon 8% copper and 1% elastin. A pair of UK size 6-10 Blister-Free Socks weigh-in at just 155g. Inside of the soft yet durable fabrics is strategically placed comfort padding; providing a luxurious feeling to the wearer. With such comfort it wold be easy to think of the Blister-Free Socks as being less durable. Your mind can be set at ease with the one year guarantee that is granted to you upon purchase. As mentioned earlier eight per cent of the composition of the Blister-Free Socks is copper. This copper weave eliminates 99% of bacteria which can greatly reduce, if not eliminate, foot odours. 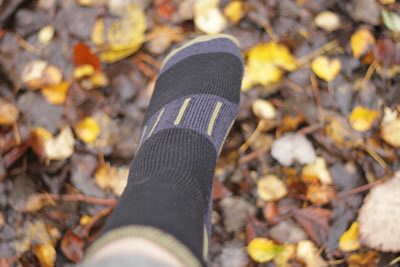 The Blister-Free Socks are not advertised as having a dedicated thermal component to them, however, the double-layer and padding does creates something of an air-barrier increasing warmth while wearing. For those that enjoy going on long hikes or those that walk regularly (such as those walking their dogs on a daily basis) these Blister-Free Socks will make your experience more enjoyable and reduce the risk of developing injuries associated with rubbing. Reducing the friction isn't only about saving your feet though; it will prolong the life of your footwear by reducing the internal destruction cause by regular use. The odour control aspects of the Blister-Free Socks can mean that you are not constantly impregnating your footwear with foot odour, making them unusable or embarrassing to remove around other people. After 'wearing-in' a pair of boots, some people may not feel that Blister-Free Socks could be of use to them. Consider buying one pair of Blister-Free Socks that you keep stowed-away for when you buy your next pair of new shoes or boots. That way you can use the Blister-Free Socks to 'break-in' your new footwear and save yourself a great deal of pain and discomfort. Owning at least one pair of these socks can be great when you have an injury from other activities such as running, exercise or after some trauma to the feet; giving your feet time to recover and additional comfort. Blister-Free Socks - when you think that prevention is better than cure. You can buy the Blister-Free Socks directly from this site.